- The Aspera Integration is an add-on module and is not available within your 3Play Media project by default. 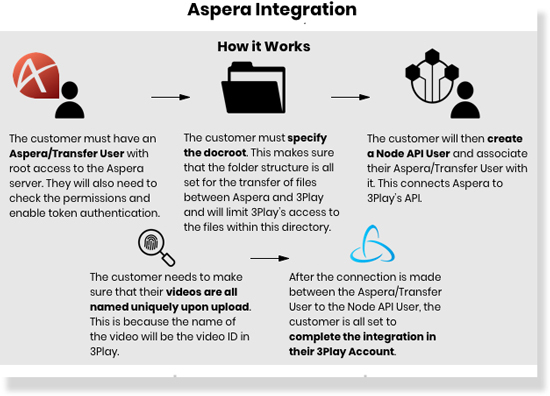 Please contact your 3Play Media account manager or 3Play Media Support to have the Aspera Integration Add-On Module enabled. - Please note that implementation is highly technical and requires our Aspera Server Configuration documentation to be shared with your Aspera technical lead contact. - Within Aspera create an Aspera/Transfer User with root access to the Aspera server. Ensure that the Transfer User permissions has token authentication enabled. - Within Aspera create a Node API User. Associate the Node API User with the Aspera/Transfer User. - Specify the docroot to ensure that the folder structure is ready for file transfer between Aspera and 3Play Media. This will also limit 3Play Media's access only to the files within this directory. - Make sure that media files stored on the Aspera server are named uniquely upon upload as the media file name will be also be used to populate the Video ID field within the 3Play Media file's metadata.